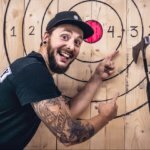 A Target Shooting experience followed by a tour at the Heineken Experience and it ends with a striptease show at a bar or at your accommodation! YES, it's your big day! After the Target Shooting you will go to the Heineken Experience. The tickets are already purchased, so you don't have to be queuing in line to purchase your tickets. 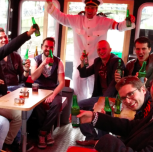 The Heineken Experience is a self guided tour of approximately 1,5 hours. Each ticket includes 2 beers and a souvenir. You can choose to have the striptease any time during your stay in Amsterdam! 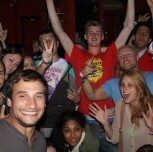 This can be at a bar in city center (we know where it's possible) or at your accommodation. 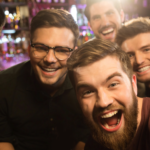 This package covers everything men need during their bachelor party/stag do or any other event with your friends in Amsterdam. ▪ Striptease | approx. 15 min. 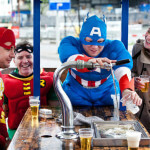 The Bullets, Babes & Beer package is € 95,- per person with a minimum of 8 people. When you are with less then 8 people, please contact us for a customized quote. Feel free to contact us when you have any questions or click here to get a quote when you would like to purchase the Bullets, Babes & Beer package. Many thanks to Juri and team for our weekend. The boys and I enjoyed it a lot! Thanks a lot Juri ! It was an amazing weekend, also thanks to you and your team. Hi Juri, I'm finally recovered... I got the tickets and the heineken was fun especially in our state... Everything was fine and he really enjoyed his week-end. When I dropped him at his home he was hardly to walk... I think he will never forget it. So it's a big success and it is partially grace to you...Thank you very much! !...For everything!! I think we will do it again together with the next one...Hope not too soon... ;D Kind regards, Lionel.